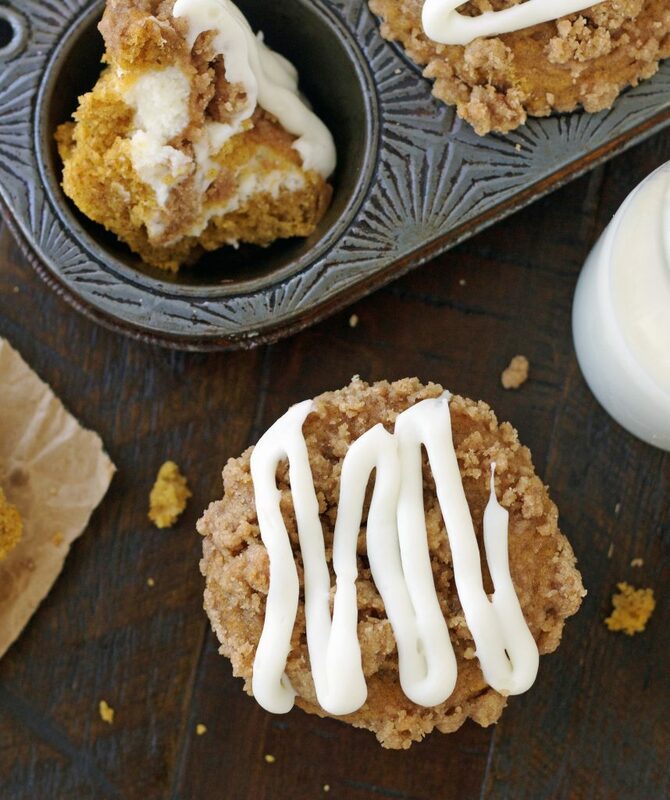 These Pumpkin Cream cheese Muffins are filled with a cream cheese filling, topped with a cinnamon streusel topping, and finished off with a sweet cream cheese glaze. Definitely pumpkin perfection going on here. We all know it’s that time of year when the pumpkin recipes flood the web, and to some it may seem like pumpkin overkill, but it’s totally my happy place. When I realized it’s been over four weeks since I posted a pumpkin recipe (gasp! ), I was pretty disappointed in myself. It’s not that I haven’t been baking up a pumpkin storm, but for some unknown reason, I just haven’t shared anything. Maybe for fear that you are all pumpkin-ed out already. If you’re not, then pleeeeease make these muffins. But if you are, forgive me and may I suggest you make some chocolate chip cookies instead. You guys, these Pumpkin Cream Cheese Muffins are so fabulous and should definitely make up for my lack of recent pumpkin posts. 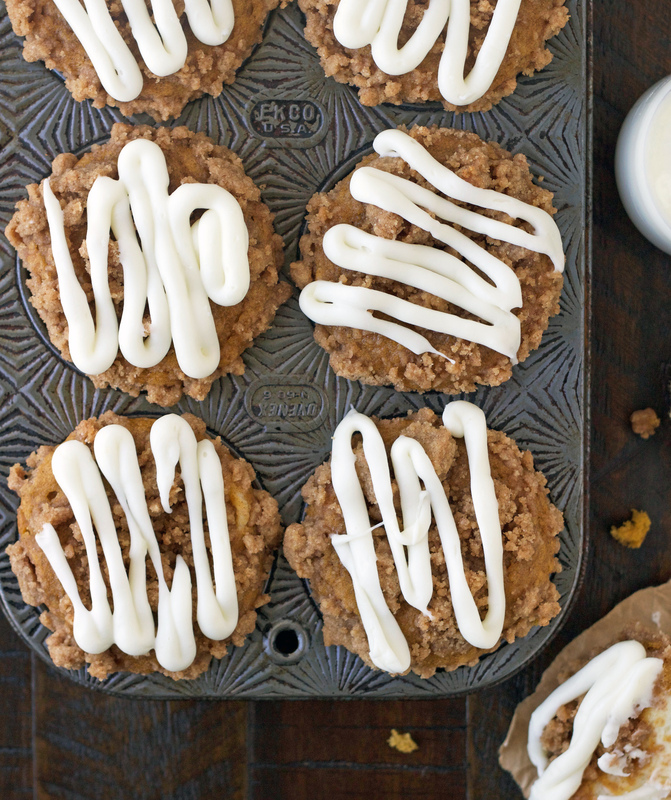 Now trust me when I say these muffins could completely hold their own, but adding cream cheese, a streusel topping and a cream cheese glaze just makes them ridiculously good. 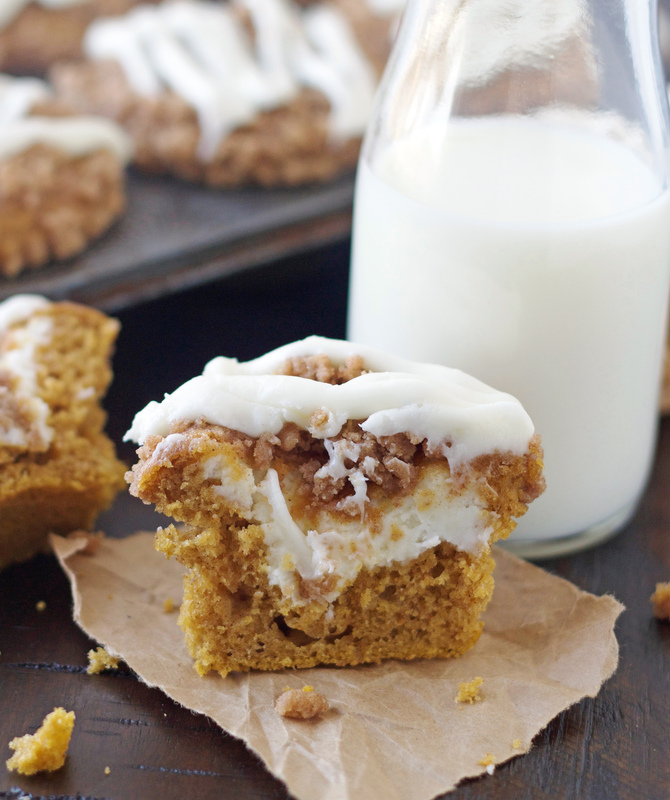 When you bite into the sweet cream cheese filling, it’s pumpkin-cream cheese heaven. Any member of this household, Zach’s friends and my sister can all attest to the fact that these muffins will completely rock your world and you really, really should make them. Preheat the oven to 350ºF. Line a muffin pan with paper liners or spray with cooking spray. Set aside. Streusel topping: In a small bowl combine the flour, brown sugar, cinnamon, and butter. Cut the butter into the mixture using a pastry blender (or your fingers work great) until mixture is coarse and crumbly. Set aside. Cream Cheese Filling: Using a hand mixer, beat the cream cheese, sugar, and vanilla together until smooth, about 2 minutes. Refrigerate while you make the muffins. Muffins: In a medium bowl whisk together flour, spices, baking soda, and salt, set aside. In a large bowl, whisk together the pumpkin, sugars, oil, buttermilk, eggs, and vanilla until smooth. Add the dry ingredients to the pumpkin mixture, and stir just until combined. Fill each muffin cup with about 2 tablespoons of batter. Add a heaping spoonful of the cream cheese mixture to each muffin. Top the muffins evenly with the remaining batter, using a spoon to spread so the cream cheese is fully covered. (Muffin tins will be almost filled to the top). Sprinkle the streusel topping over the tops. Bake muffins for 23-25 minutes, or until a toothpick stuck in the middle comes out with just a few crumbs. Let cool completely. Make the cream cheese glaze while the muffins are cooling. In a medium bowl, using an electric hand mixer, mix the cream cheese, powdered sugar, vanilla extract, pinch of salt and milk until smooth. Drizzle the cream cheese glaze over the cooled muffins. (I like to put the glaze in a small sandwich bag and snip a hole in the corner and drizzle it on that way). 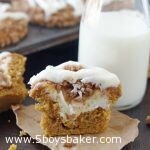 These are a “MUST” before the pumpkin season is over!! Absolutely amazing!